rise, I read the author’s bio on the jacket flap. His name is Emmanuel Hadjiandreou, and he’s a South African who learned how to make bread in a German-style bakery in Cape Town. Eventually he landed in Britain, where he worked for Gordon Ramsay and several high-profile bakeries. suddenly, the pastries were done. 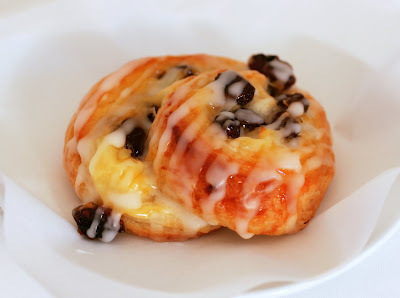 I had followed each step meticulously, mirroring the photos in the many step shots, and the dough was beautiful, and the pastries were perfect – buttery dough encasing a creamy vanilla custard and lots of sweet raisins. 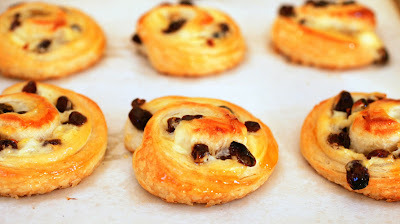 I haven’t made pains aux raisins since I was a cooking school student in Paris, and I forgot just how wonderful they are. Especially when you use an excellent, detailed recipe that works. So what’s the moral? Sometimes you can judge a book by its pretty pictures. Nice job, Chef Hadjiandreou, you’re a superstar in my book. 1. In one (smaller) mixing bowl, mix the flour, sugar and salt. This is the dry mixture. 2. In another (larger) mixing bowl, dissolve the yeast in the water. This is the wet mixture. 3. Add the dry mixture to the wet mixture and mix until it comes together. Cover with the bowl that had the dry mixture in it. Let stand for 10 minutes. 4. After 10 minutes, the dough is ready to be kneaded. Leaving it in the bowl, pull a portion of the dough up from the side and press it into the middle. Turn the bowl slightly and repeat this process with another portion of dough. Repeat another 8 times. The whole process should only take about 10 seconds and the dough should start to resist. Cover the bowl again and let stand for 10 minutes. 5. Now repeat Steps 6 and 7 twice. Repeat Step 6 one last time. Cover and let rest in the refrigerator overnight. If you are using active dry yeast, let the dough rise for another 30 minutes at room temperature before putting it into the refrigerator overnight. This will give the yeast a kick start. 6. Remove the dough from the refrigerator. 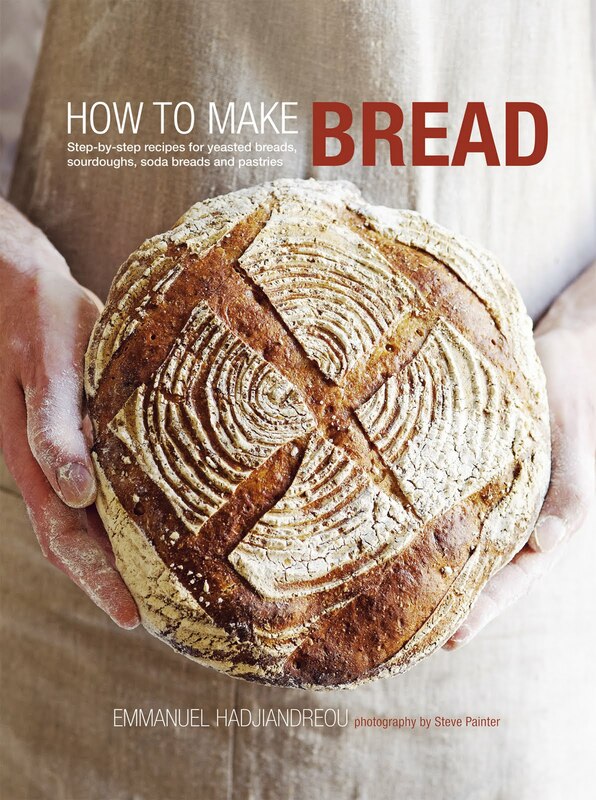 Turn the dough out onto a work surface. Pull the dough outward from the edges until you have a rough 5-inch square. Cut the butter to achieve a rectangle roughly half the size of your square of dough. Make sure the dough is about the same thickness as the rectangle of butter. Place the butter diagonally across the middle of the square of dough. Fold the corners of the dough toward the middle so that they envelop the butter and you get a neat package. Stretch the dough if necessary to completely encase the butter. Press down on the dough using a rolling pin to distribute the butter evenly through it inside the envelope. Start rolling the dough lengthwise until you have a long rectangle about ½-inch thick. Fold the bottom third of the rectangle over. Fold the top third over. You should now have 3 rectangular pieces of dough piled on top of each other. ; this is your first turn. Make a small indentation in the dough with your fingertip to remind you that you’ve made one turn. Wrap the dough in plastic wrap and refrigerate for 20 minutes. 7. Remove the dough from the refrigerator and repeat Steps 17-21 twice. You will now have given the pastry 3 turns and should have 3 indentations. 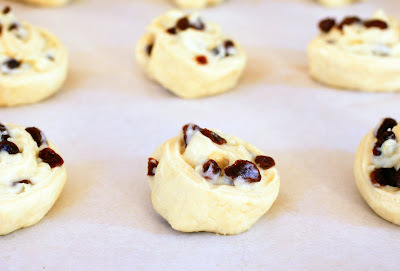 Wrap the dough in plastic wrap and refrigerate for 40 minutes. 8. In a small mixing bowl, mix the flour and cornstarch with about ¼ of the milk and whisk until smooth. Add the egg to the flour mixture. 9. In a saucepan, put the remaining milk, sugar and vanilla and heat until the sugar has dissolved and the mixture comes to a boil. Add the flour mixture and whisk vigorously. Keep whisking over the heat until it starts to thicken, then cook for another 2 minutes. Remove from the heat and transfer the custard to a bowl. Place plastic wrap directly on top of the custard to prevent a skin from forming. Let cool and refrigerate until needed (up to 24 hours). 10. 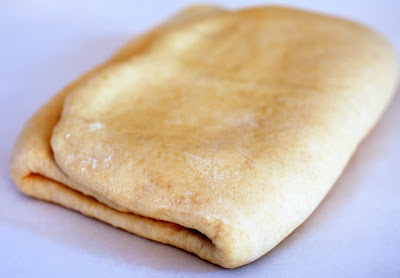 Remove the dough from the refrigerator and roll out to a rectangle about 10 x 15 inches. Whisk the custard to make it smooth, then spread it over the dough using the back of a spoon. (You may not need all the custard.) Sprinkle the raisins over the custard. Roll the dough up from a long side to make a long log. Wrap the log in plastic wrap and refrigerate for 30 minutes. 11. Remove the dough from the refrigerator, discard the plastic wrap and cut the dough into ¾-inch slices. You should have about 19 slices. Lay each pastry flat on a parchment-lined baking sheet (you will need 2). 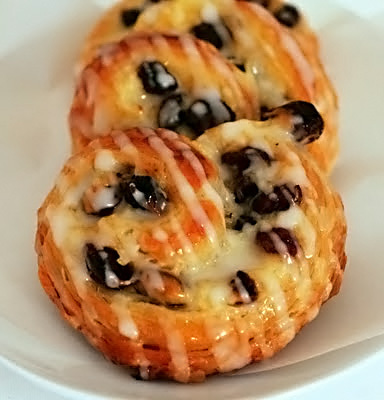 Tuck the end of each swirl of pastry underneath to help it retain its shape during baking. Allow a little space between them so that they have room to rise. Let rise until you see the folds in the pastry separating. 12. Preheat the oven to 475°F. Place a roasting pan in the bottom of the oven. Fill a cup with cold water. 13. Place the baking sheets in the preheated oven, pour the cupful of water into the hot roasting pan and lower the oven temperature to 425°F. Bake for about 12-15 minutes, or until golden brown. 14. While the pastries cool slightly, warm the apricot jam in a small saucepan. Brush the warm jam over each warm pastry. 15. To make the icing, mix 2/3 cup confectioners’ sugar with a small amount of cold water until smooth. When the pastires are cool, drizzle the icing over them.